In the wet plate collodion process photographs are created on glass or metal plates. The plates are coated and sensitised, exposed in a wet plate camera (or any camera that has been adapted to take a plate glass negative) and processed while they are still wet. Everything has to be done within 15 minutes or so, moving from the darkroom to the camera and back. It is a slow process where everything is made by hand, from preparing the plates and light sensitive material, through to developing, fixing, and varnishing the photographs. 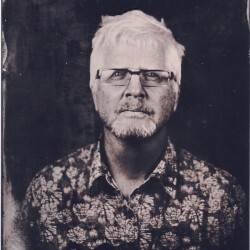 The collodion process produces a negative which, if exposed on a blackened glass plate (an Ambrotype) or a metal plate (a Tintype) is reversed, producing a one-off positive image. This technique creates stunning photographs, the combination of glass and metallic silver against a black background produces intriguing effects in terms of tone and texture. 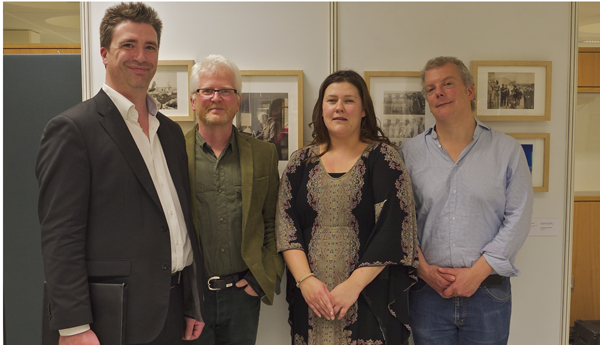 Mark Maguire, Head of Anthropology NUI Maynooth, Ciarán Walsh , Nicola Reynolds, President of thr Anthropological Society NUIM and Steve Coleman, NUIM at the opening of the Headhunter exhibition in NUI Maynooth in October 2013. A major research proposal prepared by Ciarán Walsh for the Irish Research Council’s (IRC) Employment Based Post-graduate Programme has been endorsed by the National University of Ireland Maynooth (NUIM) and now proceeds to the IRC for evaluation and adjudication. The proposal builds on the work that Walsh has been doing on the ‘Haddon in Ireland Project’ and involves a 4 year post-graduate research project supervised by Mark Maguire of NUIM in partnership with Abarta Audio Guides, a small heritage services company operated by Neil Jackman and Róisín Burke. 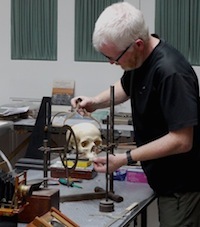 The ‘Haddon in Ireland’ research project brings together public research (NUI Maynooth), private sector innovation (Abarta Audio, Clonmel) and a researcher with a proven track record (Ciaran Walsh) to reopen and reexamine the history of human science in the British isles. 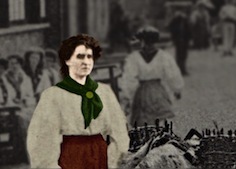 This project aims to explore the Irish Ethnographic Survey, an attempt to reveal the origins of the Irish ‘race’ undertaken by scientists from Ireland and the UK between 1891 and 1903. Among them was the famous AC Haddon. This was the beginning of ‘scientific’ Anthropology but it was overshadowed by subsequent developments in Cambridge. The records were ‘lost,’ dispersed over collections in Ireland and the UK where they have remained uncatalogued and largely overlooked for 120 years. The primary aim to reconstruct that archive and place it in the public domain. The central question is how that can be achieved, given that the material is spread over a dozen institutions in 4 jurisdictions. We will look to the latest interactive technology for solutions. We propose to create a transnational network that digitally links collections Dublin, Cambridge, London, Edinburgh and Belfast. We will develop interactive tools that will provide access to it and enhance the users experience of our anthropological heritage. The contemporary significance of this is enormous. The Survey’s attempts to trace the origins of the Irish people continues with the genetic study of populations. This project will reconnect both and the transnational component will add enormously to the impact of the project on the public construction of Anthropological knowledge. 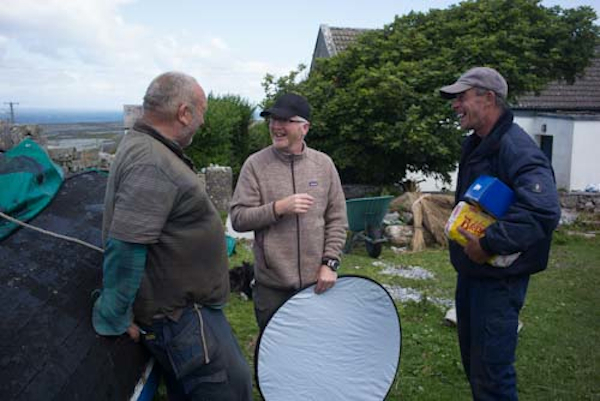 Ciarán Walsh returns to Inis Meáin with Chris Rodmell, photographer and film maker. Comments Off on Ciarán Walsh returns to Inis Meáin with Chris Rodmell, photographer and film maker. Ruairi and Chris meet after 40 years. Photo by Ciarán Walsh. 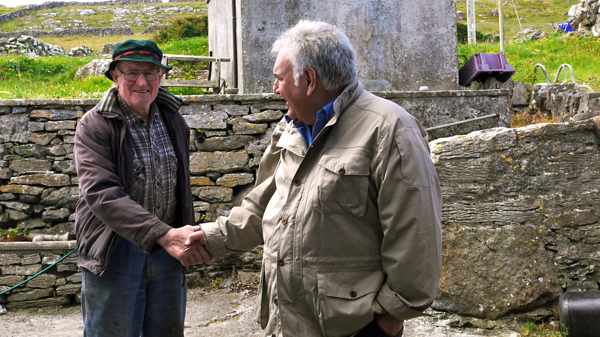 In June 2014 Chris Rodmell and Ciarán Walsh returned to Inis Meáin, the middle island of the Aran Islands, to meet some of the people Chris had filmed there in in 1973. 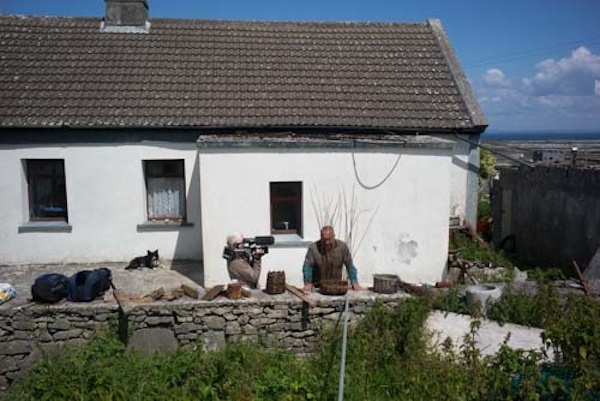 Chris, a student in West Surrey College of Art and Design, had won an award of £250 from Thames Television to film life in an “enclosed community living on one of the remote islands off Ireland or Scotland.” He chose Inis Meáin. He spent three weeks on the island, filming with a 16mm Bolex and taking photographs with a medium format Mamiya on Kodak Ektachrome professional stock. Peadar Mór, Ciaran Walsh and Muirís Mac Chonaola on Inis Meáin. Photo by Chris Rodmell. Filming Peadar Mór at work weaving a basket. Photo by Chris Rodmell. 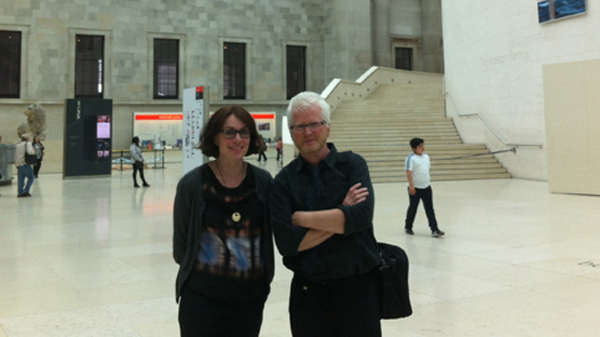 Jocelyne Dudding, Museum of Archaeology and Anthropology, Cambridge and Ciarán Walsh of www.curator.ie in the foyer of the British Museum in London. It’s a big claim, but papers presented by Jocelyne Dudding and Ciarán Walsh at the Anthropology and Photography conference in the British Museum (May 2014) have challenged the chronology of the early development of British anthropology and Haddon’s role in it. Dudding and Walsh have been working on the ‘Haddon In Ireland’ project for the past 6 months, focussing on photographic and manuscript collections that are held in Cambridge – in the Museum of Archaeology and Anthropology (MAA), the Haddon Library and the University Library. They presented preliminary finding of their research at a conference organised by the Royal Anthropological Institute and the British Museum. 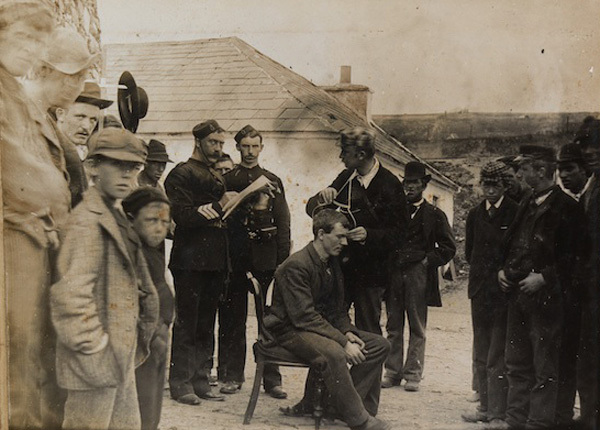 The research, part funded by the Heritage Council of Ireland, is part of a project that is attempting to reconstruct the archive of the Irish Ethnographic Survey of 1891-1903. The photographic record of the the Survey, the photograph albums of Charles R. Browne, were published by www.curator.ie in 2012 as part of the the ‘Irish Headhunter’ project. The albums are held in TCD but there was no trace of any paperwork that could place them in context. 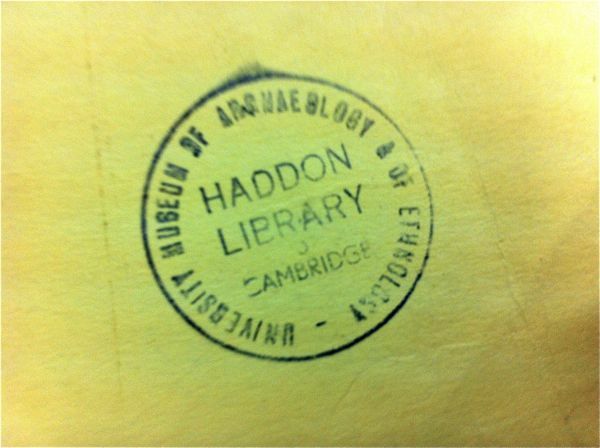 The search moved to Cambridge and significant work has been done in the photographic collections of the MAA and the Haddon Papers in the Haddon and University Libraries there. Preliminary findings suggest that the Survey, established by Haddon and Cunningham in TCD in 1891, played a much greater role in Haddon’s transition from Zoology to Anthropology than had previously been thought. The photographic record, correspondence and journal entries reveal a lot about Haddon’s role in the survey with significant implications for the history of the early development of anthropology. These are being teased as the ‘Haddon in Ireland’ project continues with the re-construction of the archive of the Irish Ethnographic Survey. Ciarán Walsh at work in the Manuscripts Room in the Library. 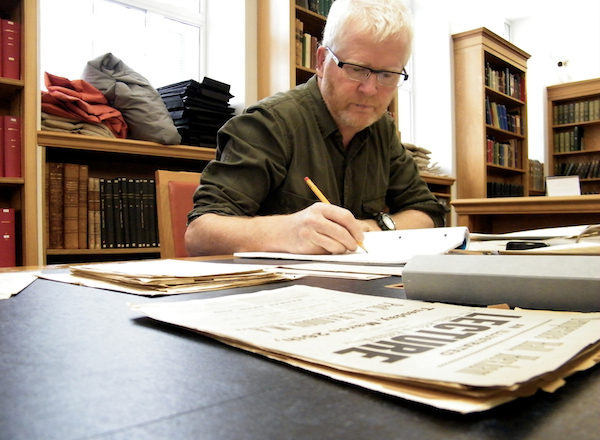 He is surrounded by documents from one of the files containing uncatalogued material dating form the early 1890s when Haddon was active in the Irish Ethnographic Survey 1891-1903. Walsh recently spent ten days going through uncatalogued material relating relating to the Survey in the photographic collection of the Museum of Archaeology and Anthropology as well as the manuscripts in Cambridge University. Working closely with Dr. Jocelyne Dudding (Manager of the photographic collection), Aidan Baker (Haddon Librarian) and John Pickles (former Haddon Librarian) Walsh discovered a lot of material – photographs and manuscripts – that shed a lot of light on the administration of the survey and the early development of ethnology in Ireland in the late 1880s and the early 1890s. The results will feature strongly in a panel on Haddon and the Survey which has been organised by Walsh, Dudding and Dr. Mark Maguire of NUI Maynooth as part of the Royal Anthropological Institute’s conference on Photography and Anthropology which is taking place at the end of May. www.curator.ie has commenced work on a project that promises to significantly rewrite the history of the early development of anthropology. Supported by a grant from the Heritage Council of Ireland, the initial phase of the ‘Haddon In Ireland’ project comprises of an assessment of unpublished photographs and manuscripts held in the Haddon Library and the Museum of Archaeology and Anthropology (MAA) in Cambridge, in partnership with Aidan Baker, Librarian at Haddon, and Jocelyne Dudding, Manager of Photographic Collections at the MAA. 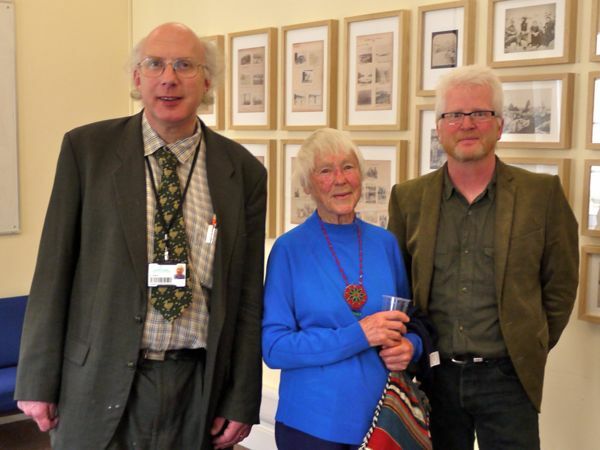 Aidan Baker, Margaret Rishbeth (granddaughter of Alfred Cort Haddon) and Ciarán Walsh at the launch of the ‘Irish Headhunter’ exhibition in the Haddon Library in 2013. The classes were held in the Foras Teanga in Dingle and the course was delivered by Máire Ní Scannláin and Caitríona Ní Chathail. Results expected in June. Ciaran Walsh, www.curator.ie, and Jocelyne Dudding of the Museum of Archaeology and Anthropology, Cambridge University have put together a panel of speakers that ensures a strong Irish dimension to a major conference on the role of photography in anthropology. The panel will include Dáithí de Mórdha of Íonad an Bhlascaoid Mhóir and Mark Maguire, Head of Anthropology in NUIM (National University of Ireland, Maynooth). It will focus on the photography of Alfred Cort Haddon and examine the importance of the Irish Ethnographic Survey of 1891-1903 in terms of a contemporary understanding of the history of anthropology and photography. The Royal Anthropological Institute has organised the conference in conjunction with the British Museum’s Department of Africa, Oceania and the Americas. The aim of the Conference is to stimulate an international discussion on the place, role and future of photography. Primarily, the period February / March has been taken up with two projects. The first involves completing the second and final year of the Dioplóma sa Ghaeilge (Dioploma in Irish) with NUI Galway in partnership with Oidhdreacht Chorca Dhuibhne – final exams scheduled for 5 April. Dar fia! The second involves development work on the ‘Haddon in Ireland’ project with the Museum of Archaeology and Anthropology, Cambridge and NUI Maynooth. This includes a paper to be given at the RAI’s conference in the British Museum in May/June. Further details to be announced in January 2014.